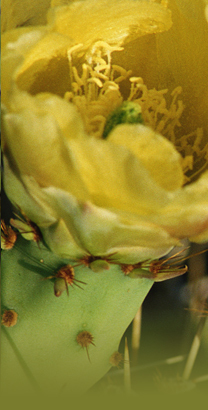 The DesertLeaf is a strong supporter of Tucson's vibrant artistic community. 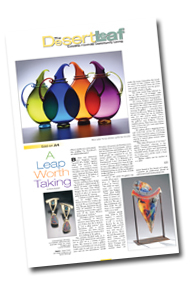 Many art galleries have benefited from advertising in our award-winning monthly publication. For our gallery and artistic advertisers who make a minimum six-month commitment, we offer Sold on Art. This column includes a profile of the gallery owner or artist and photos of the work shown at the gallery or created by the artist. Art gallery advertisers also get a free gallery listing in the Art Soup section for each month that they advertise. This listing includes general information, location, phone number and hours. The 6x consecttive contract rate allows the advertiser to take advantage of a 20% discount off our open rate. There is no minimum ad-size requirement, other than our minimum 1/12 page display ad. You may run a variety of ad sizes over he course of your 6x contract. All 6 ads must run prior to the publication of the article, and the client’s account must be current. Alternatively, if the 6x commitment is prepaid, the article can be scheduled for the first available opportunity. L'Art Pour L'Art – an independently written feature about a local artist, showcasing the diversity of Tucson’s artistic community. Curtain Going Up – Jesse Greenberg rounds up the month’s theatre high-lights, and keeps our readers up to date on the latest performance reviews. Perfect Pitch – Matt Moon reports on each month’s musical events, satisfying our readers’ wide variety of musical tastes. Click image to see an enlarged example of Sold On Art.